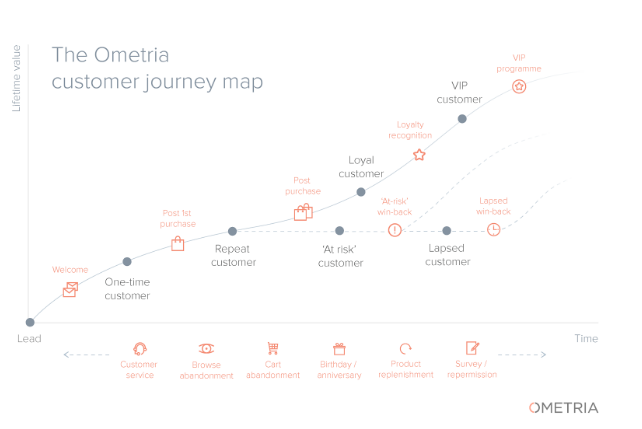 Here at Ometria, we write a helluva lot about post-purchase campaigns. That’s because these campaigns are indispensable to any brand striving for a high customer retention rate. But this post isn’t about post-purchase campaigns, per se. But rather, it focuses specifically on six good reasons for online retailers to get in touch with customers following their *first* ever purchase. The goal of writing this is to help you go about keeping first-time customers engaged by sending the right content at the right time; in other words, by using a brilliant customer lifecycle marketing strategy. FYI… Being a data-driven ecommerce marketing platform, it’s important for us to first stress that, in order for you to act on any of the below, you first need to have access to multichannel order data—otherwise you will struggle to recognise customers’ first orders. 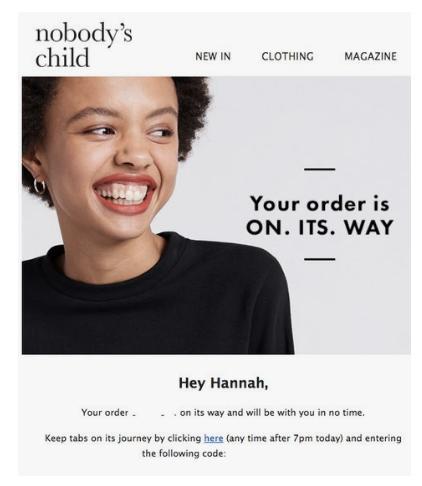 These are the automated emails associated with the first purchase; for example, “your first order has been shipped” or “your first order has arrived”. 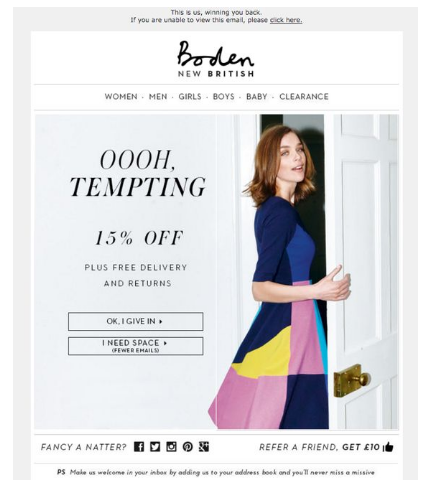 Transactional emails such as these are great, as they keep a customer in the loop—particularly important for those that haven’t shopped with you before and aren’t sure what to expect. It’s worth pointing out here that transactional emails such as the above don’t need to look like standard confirmation receipts. There are ways you can make them more fun, chatty and personalised (check out this blog post to learn how). From the brilliant image to the comical copy to the "track your order" functionality, this email is post-purchase perfection. In an industry as competitive as retail, ecommerce brands should always acknowledge when a customer has chosen to spend their hard earned cash with them; so if you don’t say thank you in your transactional emails, it’s worth including it in a follow-up message. (N.B. To work out the best time to send your follow-up message, you can use what we call ‘order gap analysis’, which you can read more about here). Cross-sell: Use a product recommendation engine to recommend items based on the product purchased; this could be based on the item itself, category or price-point. Likewise, if a customer has visited your website since making a purchase but not bought anything, you can base recommendations on the items browsed. Upsell: On the back of the point above, you could also promote any new products in your store that relate to the product purchased. For example, if a new shade of the lipstick range bought has been released, you could mention that. Content related to the purchase: As we all know, good, quality content is one of the most important marketing tools today, so if you have an in-house blog or magazine with posts relating to a purchase, it’s worth including it in your follow up emails. 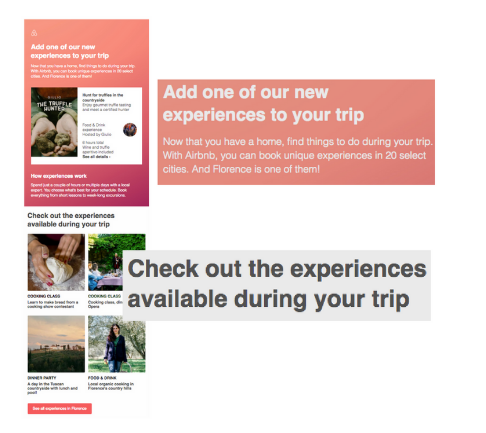 If you’re a bit of a globetrotter, you’ll know that this is something Airbnb does incredibly well. Whilst this isn’t strictly an ecommerce example, it shows how sending follow-up content can keep post-purchase good vibes high. For retailers, this might mean sending aftercare information, or content related to the category that was purchased (e.g. sending a ‘summer wedding hacks’ blog post to someone who has bought from the occasionwear category’). Any brand that wants to keep improving both its products and its customer service should be asking customers for feedback. Brand new customers are no exception—they might even have some thoughts on your brand that you’ve never come across before. 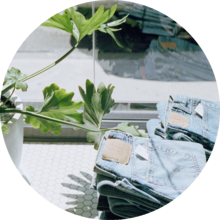 There are numerous quirky ways retailers can go about asking for reviews, to ensure the process isn’t too dry. For example, the below example from the (now closed) “Kate Spade SATURDAY” keeps the tone upbeat and lighthearted with smiley faces and informal copy. 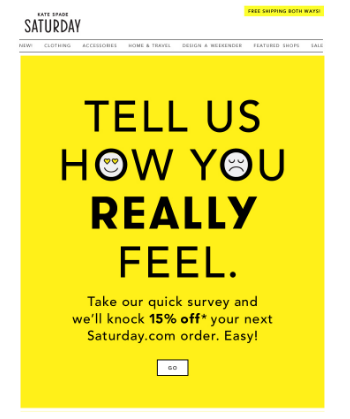 It also rewards customers that do provide feedback with a cheeky discount. If the item is replenishable (for example: beauty, hair and wellbeing products, as well as food, drink and stationary), you can send an email reminding the customer they may be about to run out of the product. Reminder emails like this are usually sent 1-2 week prior to the replenishment due date. How to work out when this date should be for a new customer with no order history? In theory, you might be able to look at whatever behavioural data you have about the customer, and use this to find other customers with similar behavioural traits who also bought and replenished the same product, and use that to determine when to send the email. However, in general, if an algorithm/system is unable to figure out anything clever it will fall back on average repurchase rate for that particular product, and use this as a benchmark instead. If you’re a brand selling luxury jewellery and/or watches, the likelihood is your customer’s purchase will need the occasional MOT. Using data, figure out the best time to contact your customer to check whether their item is in need of, for example, a clean or new battery. Let’s face it: some items are just high maintenance. From top-notch hair straighteners to cutting-edge spiralizers, if your brand sells items that need a lot of aftercare or advice, you can send customers helpful content such as aftercare instructions, hints and tips or reviews from other customers (or even nice extras like leather creams or gentle cashmere conditioners…). 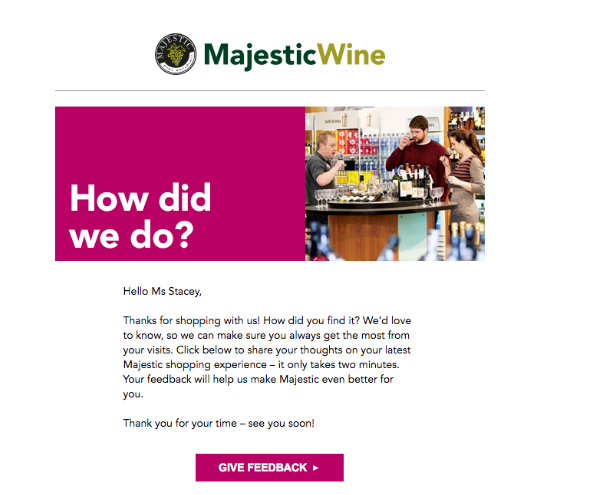 Looking a little further down the line, anniversary emails are a great excuse to get in touch with a first-time customer, especially if they have not repurchased in all that time. Everyone loves an anniversary. There’s just something oddly fascinating about realising it has been a month, year or decade since a certain event. This is something Facebook realised years ago with its “You became friends with Gertrude Thomas five years ago today!”. Using an ecommerce marketing platform such as Ometria, you can automate first-purchase anniversary emails in just a matter of clicks. Birthday emails are equally as easy to send, and go a long way with customers—especially if you include their name, personalised product recommendations and/or a discount. For obvious reasons, finding out a customer’s date of birth is critical here. This can be done either during the newsletter sign-up process, or by sending out an email asking recipients to include their DOB in their account settings. In a win-back email, you can also include dynamic product recommendations—either based on the purchase/browsing habits of the customer, or, if this data is limited, customers with a similar taste profile to them. N.b. To figure out whether your customer has indeed “lapsed”, you can again use Order Gap Analysis. This will enable you to define what constitutes “active”, “at risk” and “lapsed” periods in between purchases. Whilst we have focused primarily on email in this blog post, you can target first-time customers via social media as well, using custom audiences. This is particularly true if your email marketing does not appear to be working. 💡 If a customer makes a second purchase, cancel any campaigns focusing purely on the first one. Likewise, cancel any lapsed campaigns. You will need access to all of a customer’s data - across multiple touch points - in order to know if and when they’ve made a purchase. For example, if a customer makes a second purchase offline, it’s still incorrect to send them an email asking where they’ve been. 💡 Likewise, be careful not to cross-promote any items a customer might have bought in-store or shortly before your follow up email is due to go out. 💡 Look at all of your customer’s behavioural data to check whether they are interacting with your brand, even if they’re not purchasing. You can then tailor this information to your post-purchase emails. For example, if a customer has been looking at a dress from your brand on Instagram, it doesn’t make much sense to ask them where they’ve been and tell them you miss them (as, technically, they’ve still been engaging).